They aren’t ready for the Pro’s. They could have come back, and worked on their bodies and their games. They could have had an epic, unforgettable, life-altering year challenging for a National Championship at UCLA this upcoming season. They could have left a legacy, bringing UCLA back to Nationally Elite status. Despite all of that, Zach LaVine, Jordan Adams, and Kyle Anderson decided to quit on UCLA and bail prematurely for the NBA… and it looks like that mutual decision was NOT as insane as I’d like to think. All three of them did indeed get selected in the first round, somewhat validating their decisions. Of course I have mixed emotions about them leaving. I am angry, and wished they stayed. However, it is best for UCLA if these Bruins are successful in The League, so I have no choice but to wish them well. 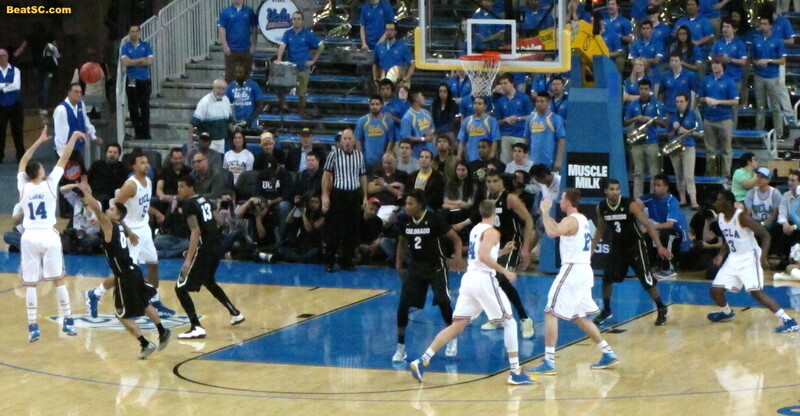 I have very little trouble rooting for Anderson, as he actually played for UCLA a year longer than anticipated. He could have left after last year if he wanted, but he came back and played with heart, coming closer to averaging a triple-double than anyone else in the entire nation. And it looks like he earned some good karma, because he got picked with the last pick of the first round, by the World Champion San Antonio Spurs, who return the nucleus of their Title-Winning Team. Only Boris Diaw is departing, and that opens up a perfect slot for Anderson to fill. We may just be watching Kyle in next year’s Finals. I’m a little less happy about Jordan Adams’ departure. He had announced that he was returning to UCLA, then changed his mind a day or two before the deadline to announce for the Draft. He decided to leave, despite having no assurance that he would be drafted at all. But when the Memphis Grizzlies made Adams the 22nd pick of the 1st round, that mitigated some of the frustration I felt when he double-crossed us. At least he didn’t leave “for nothing.” He may not be ready to be a big-time contributor as a Rookie, but he has a tough, hard-nosed determination, a nose for the Basketball, and a knack for scoring points that should make him stick at this level for a long time. I do NOT fault the Grizzlies for making this pick, although I have a feeling Anderson — who went a full 8 picks later — has a Basketball IQ, court awareness, and all-around savvy that will make him the more valuable player of the two. That superiority will be infinitely magnified by playing in the Spurs TEAM system, under the League’s best Coach Gregg Popovich. Now we come to Zach LaVine. Zach was the first Bruin to be selected, at number 13, by Kevin Love’s Minnesota Timberwolves. Of course, LaVine may never get to play with Love, since Kevin may be traded during the off-season. If they lose Love, without getting a hell of a lot in return, they will be a bad team, that will not see the Playoffs for a long time. That projected mediocrity might or might not be the reason that Zach looked so non-plussed when the pick was announced. No smile was evident as he got up to accept his T-Wolves cap and go on stage. In fact, he muttered something, which many people thought was “F*ck Me!” After watching the replay, I disagree. I don’t think that’s what he said, but I do agree that he looked extremely disappointed with the selection. This immature attitude is another reason why it is hard to root for this guy. I think that he has a tremendous upside, unreal athletic ability, and is NOT a bad risk by Minnesota. However, his mental weakness could make them regret this pick. LaVine showed SO MUCH potential in the first third of last season, but after hurting his hand on a dunk, he was never the same. His dunk attempts plummeted, and his shooting percentage flatlined. He basically TANKED the rest of the season, apparently “saving himself” for the NBA, knowing that he had already shown Scouts enough to get drafted. Then after the season, he and his family are reported to have slammed Coach Alford for mis-using him, for favoring Alford’s son over him, forcing LaVine to leave for his own good. So with all that in mind, I hope Love gets traded to the Lakers, and LaVine puts up respectable numbers for a cellar-dwelling Timberwolves squad. That way, UCLA will still get some good press, but LaVine won’t get too much glory, especially not in the Playoffs. The bottom line of Draft Day was that UCLA is back as a National Powerhouse, supplying more First Rounders than any other school in the Country. UCLA is once again being recognized as a wise choice for elite players who want to get to The League. Hopefully, Alford can parlay that buzz into stellar recruiting over the next few years and beyond… unless the opposing school of thought prevails: That Alford couldn’t progress beyond the Sweet 16, despite having 3 First Rounders on his roster. Ben Howland managed 3 straight Final Fours with similar rosters. Alford will have to kick recruiting up a notch to get another shot at cracking the Elite Eight or better. And in other news, no trojans were drafted. "THEY CHOSE… WISELY" was published on June 27th, 2014 and is listed in Blue & Gold News, UCLA/usc/Sports Photos.